The San Francisco Bay Area CC is looking for volunteers to assist at their forthcoming wheelchair curling clinics in San Jose: October 14 and October 28 from 10am to noon. Contact Brian at bayareacurling.com for details. London (Ontario) Calling - any wheelchair curlers? Coach Ernie Comerford, who established the wheelchair curling program in Alberta, is now living in London Ontario and is hoping to re-establish wheelchair curling there. Contact him if you want to play or help out. You can read about his approach to coaching and download his drills HERE. The USA wheelchair curling program has two clinics coming up; October 15th at the Potomac CC in Laurel MD (outside Baltimore) and October 23rd at the Cape Cod CC in Falmouth MA. Vernon will host the first ever BC Provincial Championships. Selection for Team BC had previously been the responsibility of a CurlBC coach, and CurlBC will be appointing a coach and alternate to accompany the winning team to the Nationals in Nova Scotia. Deadline for applications to be received by the CurlBC office is December 22nd and participation will be limited to 8 mixed gender teams. In the unlikely event that more than 8 teams apply, there will be a playdown. Contact Heather Beatty for more information. Sonja Gaudet is trying to arrange accessible accommodation, Contact her for information. Norway won the season's opening international event, beating out host Denmark in a five team field. The Czech Republic, Germany and Scotland also competed. With the cancellation of the Norwegian Open because of construction delays, Team Canada will make their first international appearance at the Kinross Invitational in Scotland, October 21-23. The five members of Team Canada 2008 (Darryl Neighbour, Gerry Austgarden, Ina Forrest, Sonja Gaudet and Gary Cormack - all from BC) will be joined by Alberta's Bruno Yizak, Manitoba's Chris Sobkowicz and ex-Brier BC skip Jim Armstrong. Canada is still hopeful that the WCF will change their mind and decide Armstrong is eligible for the Worlds and the Paralympics. He will have his status reviewed by an WCF eligibility assessor during the Scotland trip. Team USA skip Augusto "Goose" Perez has been invited to be the keynote speaker at Syracuse University's kickoff to National Hispanic Heritage Month. The five BC athletes on Team Canada 2008 can compete in the 2009 provincial playdowns - with one proviso: no more than two members on any one team. This avoids any embarrassment were they to all play for a team that did not qualify for, or win the national title. British Columbia's laudable decision to scrap selection camps in favour of a provincial playdown is running up against a harsh fact plaguing all provincial programmes - too few female participants. Going into its sixth season, BC has just five women with any playing experience, and two of those are Team Canada members. WCF rules define wheelchair curling as a mixed gender sport. This is of little consequence to the rest of the world who (apart from Scotland) have just enough participants to qualify for the Paralympics. In Canada, with potentially thousands of participants at hundreds of clubs, ambitious curling teams must include 25% women, even though women comprise far less than 25% of the potential athlete pool. 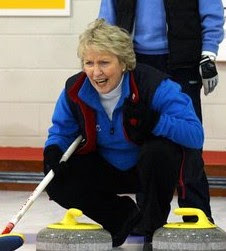 If the idea is establish curling in Canada as the primary winter recreation for wheelchair users, there should no impediment to team formation. As present CCA policy precludes the national champions from representing Canada in WCF events, then it shouldn't matter if provincial teams are mixed gender or not. If on the other hand, the idea is to encourage women to play a mixed gender sport, then present athletes, coaches and provincial bodies need to do a far better job at outreach if overall growth is not to be stymied by a lack of women. Six pairs competed in this B.C. event, sponsored for a second year by Olsen. 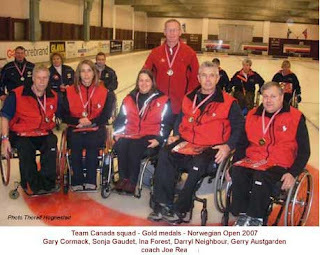 Four members of Team Canada competed, with Darryl Neighbour and Gary Cormack beating the round robin winners, Gerry Austgarden ad Sonja Gaudet, in the final. The International Curling Club, in the border town of Osoyoos in the Okanagan valley is hosting the 2nd Annual 2 on 2 bonspiel this weekend (click for details). Abbotsford CC hopes to start a new league on Monday evenings open to wheelchair users plus family and friends. There will be a 'give-it-a-go" session on October 6th at 7.30pm, which will be followed by 4 session "learn to curl from a wheelchair" program. Contact the club (604-859-9244) for more details. Wheelchair curlers will again be active in Kelowna and Vernon, Prince George and at Marpole and Richmond on the Lower Mainland, as well as the Juan de Fuca centre near Victoria. BC are hoping that enough teams will form to allow a playdown for the right to represent the province at the 2009 Nationals next March near Halifax NS. Six national squads will be competing at the 2008 Danish International Wheelchair curling Cup this weekend in Taarnby, Denmark. The Curling Today blog reports Scotland are taking four of their six member national squad; Michael McCreadie, Angie Malone, Jim Sellar and Rosemary Lenton making the trip. They will compete in a round robin against teams from Germany, Czech Republic, Norway, Russia and Denmark. The Norwegian Open that was to be held in the new Halden Curling Centre in October has been cancelled due to construction delays. Last year's event was won by the Canadian squad that went on to represent Team Canada at the 2008 World Championship.